Mrs. Earle served the Chicago Chapter as a member for many years; as Director and Chairman of Printing; as Corresponding Secretary, and First Vice Regent; for two years as Chairman of Patriotic Education Committee; was Illinois State Chairman and Founder of the Philippine Scholarship Fund Committee, and went over the top for Illinois; four years as national Vice Chairman of the Philippine Scholarship Fund Committee. During the World War, Mrs. Earl prepared herself as an instructor and received the official diploma of the Red Cross. She went into Auxiliary No. 1 of Chicago Chapter and taught evening classes for months as the DAR Red Cross room. 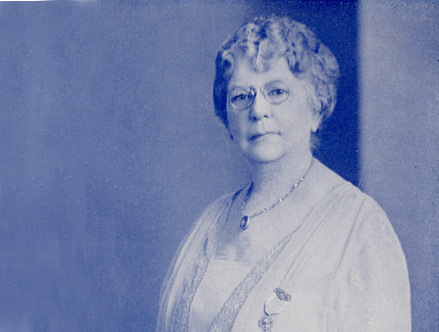 She served as Regent of the Chicago Chapter DAR, 1924-26, Her two-year term as Regent was characterized by very business-like and efficient leadership. Mrs. Earl was very insistent on all calls from the National Society being obeyed. The Chapter gave liberally to all patriotic work; to mountain schools, International College an Ellis Island. One hundred dollars, the first large check from any one, to Wakefield. Five hundred to Kenmore; or a bout fifteen hundred dollars in one year. Many other civic and patriotic causes were helped: one hundred dollars given the Chicago Art Institute for its new building. The Chapter membership had a gain of about fifty. The fund for building Constitution Hall was begun in her first year, with our per capita about $11,000; she raised over $8,000.00 the first year and finished, about $11,000, the second year, leaving the next Regent to pile up a goodly excess to our credit. Bronze medals were presented at U.S. Naval Station, Great Lakes, Illinois, to three recruits who attained the highest efficiency during the year. Heretofore only two medals had been given by the Chicago Chapter but to the School of Aviation, U.S. Navy, had been added and Mrs. Earle presented the third medal for the last time, as the U.S. Navy moved the School of Aviation to the Pacific Coast. Mrs. Earle was Illinois State President of U.S. Daughters of 1812 for four years.